Gloves do not protect you from exposure to all chemical reagents. Gloves have specific resistance to chemical reagents. Occupational Health & Safety Magazine (OHSonline) has an interesting article about disposable gloves. https://ohsonline.com/Articles/2010/04/01/Nine-Myths-About-Disposable-Safety-Gloves.aspx. 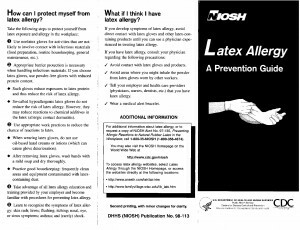 EHS TODAY online has 2002 information about “N-DEX® Free” the only disposable rubber glove that can be labeled “non-allergenic”. http://ehstoday.com/mag/ehs_imp_35853. Theories have emerged suggesting possible causes of allergic reactions after wearing nitrile gloves.